Liz's Paper Loft: MCT November Release Sneak Peek Day 2 ~ life is better! 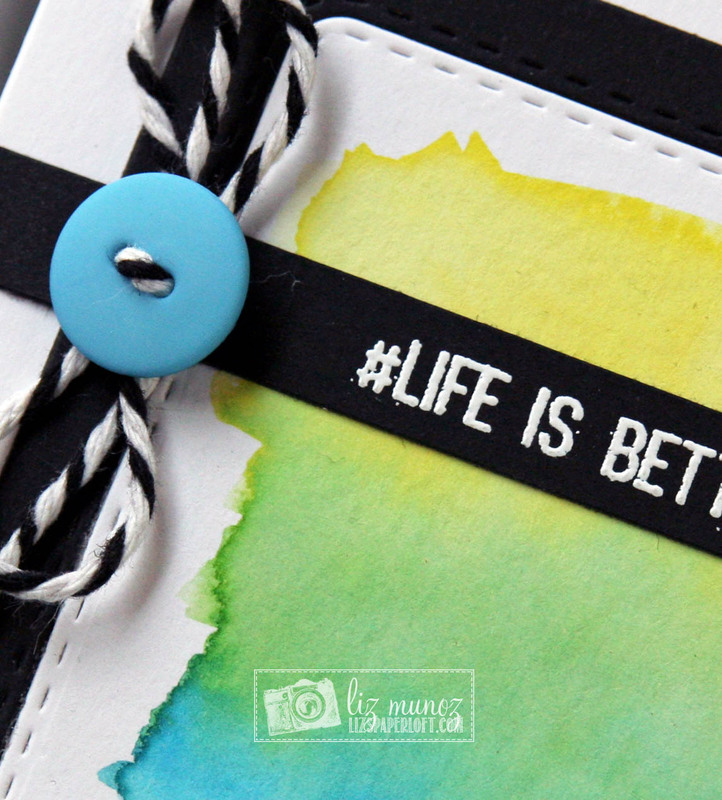 MCT November Release Sneak Peek Day 2 ~ life is better! for, so I made a card! watercolor paper inside the black frame. I quickly gave the watercolor paper a wash of yellow, green, and blue using distress inks. I'll see you again tomorrow! Very pretty card Liz! Love the watercolor look inside the frame... cute little card to display or give to someone. TFS! Your card is so pretty....great water color job....love how you used today's sneaky peek.....this would be great to put on a magnet and have on the frig as a daily reminder!! You so will make someone's day!! YOU so ROCK!! Very pretty background! 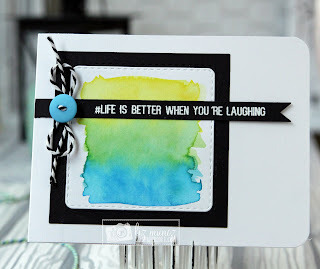 Adorable layout for a card!! 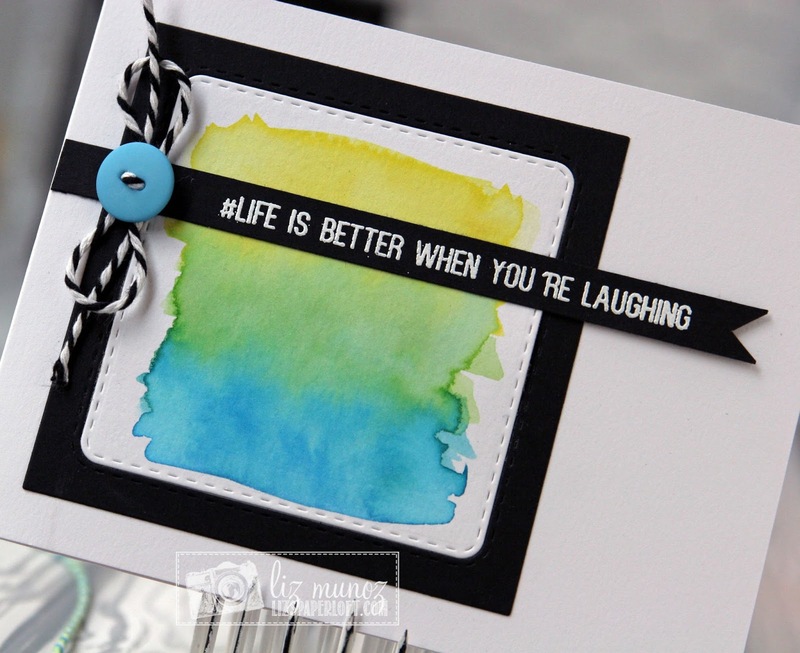 Love the watercolored background. The sentiment really stands out. Gorgeous! I love how you used this set! Super cute!! This is a great set!! Very nice card Liz! The colors look great. Good Job!!! Very nice card Liz! Great watercolour background too! I like the card design and splash of color...the button is a great accent. I can't wait to see all of the sentiments...this one is so true :D Beautiful job. Beautiful card! Love the watercoloring! Thanks for sharing your wonderful card. Love your watercoloring. I like the water color background and the sentiment. Liz ~ EEK!! another GORGEOUS creation! LOVE the black against the watercolors!! EEK! Beautifully done as always!!! MCT November Release Blog Hop ~ hi sweetie! MCT Tag It Tuesday ~ merry christmas! MCT Trending Now Peek-a-boo Cards ~ congrats! MCT What A Treat Wednesday ~ for you!